DW Life > d i v e r s i t y w o m a n . c o m W i n t e r 2 0 1 8 D I V E R S I T Y W O M A N 41 1 Call the companies where you know the fraud occurred. Contact the fraud department, and ask to close or freeze accounts, then change log-ins, pins, and passwords. Keep track of whom you speak to, and ask for a letter confirming the action taken. 2 Place a fraud alert on your credit report. You'll only need to call one of the credit bureaus to do this (Experian.com/frau- dalert, 1-888-397-3742; TransUnion.com/fraud, 1-800-680-7289; Equifax. com/CreditReportAssis- tance, 1-888-766-0008). Make sure to order a report and review it for any accounts or transactions you don't recognize. 3 Report the ID theft to the Federal Trade Commission (Identi- tyTheft.gov, 1-877-438- 4338), and provide as much information as possible. You may also want to file a report with your local police department. 4 Close any new accounts opened in your name. Call the fraud department at the company where the account was opened, explain the circum- stances, and ask that the company send you a letter confirming that the account has been closed and that you are not liable for any charges. Keep track of whom you spoke with, and keep the letter when it arrives. 5 Remove any fake charges from ac- counts by contacting the fraud department of the company and filling out the appropri- ate paperwork. Again, keep track of whom you spoke with, and ask for a letter of confirmation. 6 Correct your credit report. Write to each of the three credit bureaus alerting them to the fraudulent information. Provide your identity, and ask that the information be blocked. This means it will not be available to anyone running a credit check on you. 7 Finally, consider adding an extended fraud alert or credit freeze to your report. An extended fraud alert is free, lets you have access to your report as long as companies take certain steps to verify your identity, and lasts for seven years. A credit freeze costs money and stops all access to your report until you unfreeze or lift it. 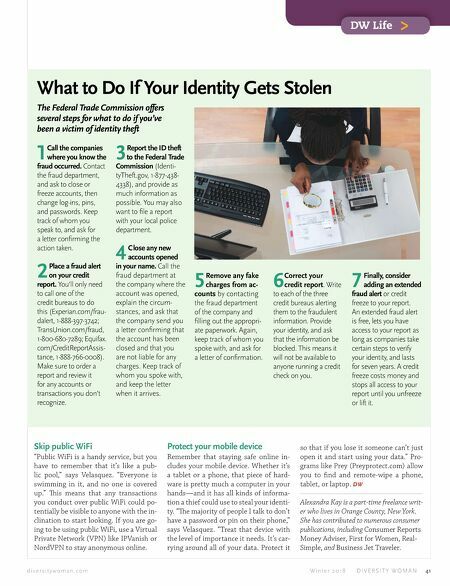 What to Do If Your Identity Gets Stolen The Federal Trade Commission offers several steps for what to do if you've been a victim of identity theft Skip public WiFi "Public WiFi is a handy service, but you have to remember that it's like a pub- lic pool," says Velasquez. "Everyone is swimming in it, and no one is covered up." is means that any transactions you conduct over public WiFi could po- tentially be visible to anyone with the in- clination to start looking. If you are go- ing to be using public WiFi, use a Virtual Private Network (VPN) like IPVanish or NordVPN to stay anonymous online. Protect your mobile device Remember that staying safe online in- cludes your mobile device. Whether it's a tablet or a phone, that piece of hard- ware is pretty much a computer in your hands—and it has all kinds of informa- tion a thief could use to steal your identi- ty. "e majority of people I talk to don't have a password or pin on their phone," says Velasquez. "Treat that device with the level of importance it needs. It's car- rying around all of your data. 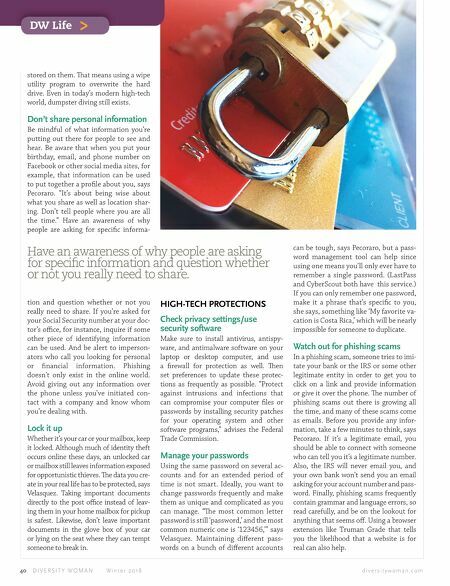 Protect it so that if you lose it someone can't just open it and start using your data." Pro- grams like Prey (Preyprotect.com) allow you to find and remote-wipe a phone, tablet, or laptop. DW Alexandra Kay is a part-time freelance writ- er who lives in Orange County, New York. She has contributed to numerous consumer publications, including Consumer Reports Money Adviser, First for Women, Real- Simple, and Business Jet Traveler.